Implementation costs include development expenses, license costs, and hardware costs. Code availability (program or VHDL in case of a hardware implementation) must be taken into consideration here as well. All protocols allow for a software implementation of the master on a standard Ethernet chip. 1 No open source master, only sample code that does not warrant applicability. 1 With EtherCAT, special network components are required for star or tree topologies. For EtherCAT, SERCOS III, and PROFINET IRT, bus protocol implementations into a slave require hardware solutions (ASICs or FPGAs). For POWERLINK, EtherNet/IP, and PROFINET RT, microcontroller-based software solutions are also feasible. Expenses for software solutions comprise license costs for the stack, possibly complemented by extra costs for more powerful and therefore more expensive controllers. For hardware solutions, users may opt for either FPGA- or ASIC-based communication interfaces. In principle, FPGAs may also be used for software solutions. An FPGA (Field-Programmable Gate Array) is an integrated circuit that hardware developers can configure themselves. It consists of programmable logic components, so-called logic blocks, and a hierarchy for the reconfigurable component circuitry. All logic functions ASICs are able to execute can be implemented with FPGAs as well. Functionality can be customized before commissioning. The one-off development costs for FPGAs are lower than that of ASICs. FPGAs comprise an attractive technology for Industrial Ethernet solutions primarily due to these lower expenses, their high performance, and multi-protocol capability, but also because they allow for using pre-assembled components to integrate Layer 2 functionality (hubs, switches). However, users need to be aware that the complexity of a protocol has an impact on the volume of code and, by extension, the required number of logic blocks. L2 functionality can also have a substantial bearing on this number. Switches need more blocks than hubs, and complex managed switches require an excessive number of logic blocks. POWERLINK is the least complicated real-time Ethernet solution. Moreover, since POWERLINK only resorts to hubs in its network layout, this protocol requires only a small number of logic blocks, and is suitable for small FPGAs. EtherCAT and SERCOS III, on the other hand, are more demanding and therefore need many more logic blocks. 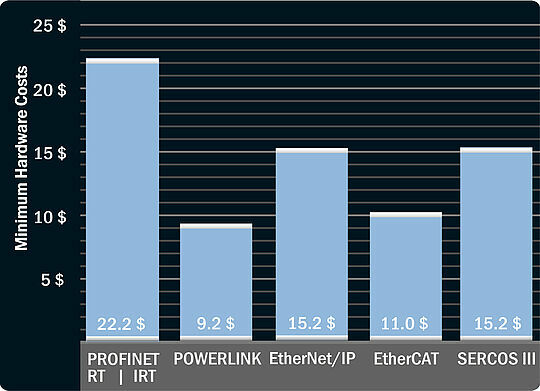 The connection costs per node below refer to the running expenses for the hardware. Potentially owed license costs for software stacks etc. have not been taken into account. The figures in this diagram have been derived from feedback from various manufacturers with implementation experience covering different Industrial Ethernet solutions. Several figures have also been quoted by manufacturers in automation industry magazines. Costs for the PHY (2 × 1.1 $) have been factored in equal measure for all protocols. Connectors are excluded. Cost estimates per node are made for an annual volume of 1000 units. PROFINET: The calculation reflects a solution with an ERTEC200 ASIC. Future implementations may also use devices equipped with a TPS1 chip developed by Phoenix Contact. In that case, costs are likely to drop to a level comparable to EtherCAT. POWERLINK‘s price level will not be met. POWERLINK: The calculation applies to an FPGA-based solution. RAM and flash memory costs have been taken into account. EtherNet/IP: The EtherNet/IP figure applies to a typical FPGA solution. EtherCAT: The calculation is based on the least expensive EtherCAT ASIC solution with two Ethernet ports (ET1100). EtherCAT solutions for FPGAs are much more costly; the difference is most striking for synchronous solutions with real-time clocks. SERCOS III: The SERCOS III figure applies to a typical FPGA solution. Operating costs largely consist of maintenance and network administration expenses. Some technologies such as EtherNet/IP with CIP Sync and PROFINET IRT are highly complex and may therefore entail considerable network administration costs. Moreover, any use of managed switches requires network expertise. In many cases, a network engineer will be needed on location for commissioning and maintenance. The synchronization technology used by a solution plays a key role for real-time communication. POWERLINK and SERCOS III ensure synchronization via a master-managed mechanism that is very precise and very rarely disturbed by faults. PROFINET IRT and EtherNet/IP with CIP Sync depend on an IEEE 1588 compliant synchronization mechanism. That results in significantly more complex network administration, especially if devices must be isolated because they trigger synchronization faults due to hardware or software failures. Functions such as hot plugging – i.e. the option to swap devices on a live network – can also help greatly to bring down maintenance costs: replacement devices can be updated and configured without any impairment to the real-time function of the system as a whole.